In the past I’ve tried to combine trips to Colorado to see Tyson and his family with birding trips or visits to National Parks. I’d originally started this trip with that idea but abandoned it when I discovered the day before leaving that there was something awry with the electrical system in my camper. So, I decided to take the Prius instead, thinking I would save quite a bit of money on fuel. I timed the trip so that I could see the kids play soccer, the center of their world this time of year. I managed to see six kids’ games in two weekends, with a trip to see Denver’s professional soccer team thrown in. I long ago quit taking photographs at soccer games because I ended up missing too much of the game. I still missed much of the game because I was focusing almost solely on how the grandkids were playing, but I had a good time rooting them all on. I also managed to watch Zoe and Sidney run a mile race for their school. They both came in 6th in the district run, a very respectable showing considering that they didn’t train for the race but, instead, relied on their soccer conditioning. I really found out how good of shape the whole family was in when we hiked on my last Sunday there. Sidney, a fourth grader, had to wait for me to catch up and I heard “Come on gramps” more than once on the trip. Turns out that hiking at 11,000 feet is quite different from walking at 10 feet of elevation on Owens Beach. I did manage to get in some birding when the kids were in school, but one of my favorite parts of the trip was coloring with Logan, Zoe, Sidney, and Jen. I made the mistake of going into Michael’s with Jen and the kids to buy a birthday present for a party one of the kids was going to. I immediately got distracted by the display of “adult” coloring books at the front of the store. I browsed the display while they shopped for the present, and when they returned I asked if the two girls wanted to each get a book. They eagerly, if slowly, each picked out a book and I bought two books for me. It was a good thing I bought two or I would have had to go without one since Logan wanted one, too, once we got home. It’s been forever since I last colored, but I really enjoyed coloring with the kids. I only managed to complete one page from Julia Snegireva’s Zendoodle Coloring: Inspiring Zendalas while I was there. Although I follow a few bloggers who occasionally post mandalas (usually ones they’ve created themselves), I didn’t realize what a phenomena adult coloring book have become, until I got home and started looking online. After reading an article that suggested that some psychologists were prescribing coloring books as a way of dealing with stress, I asked Gavin if he would like one and he told me he would so I bought one for he and his sister. 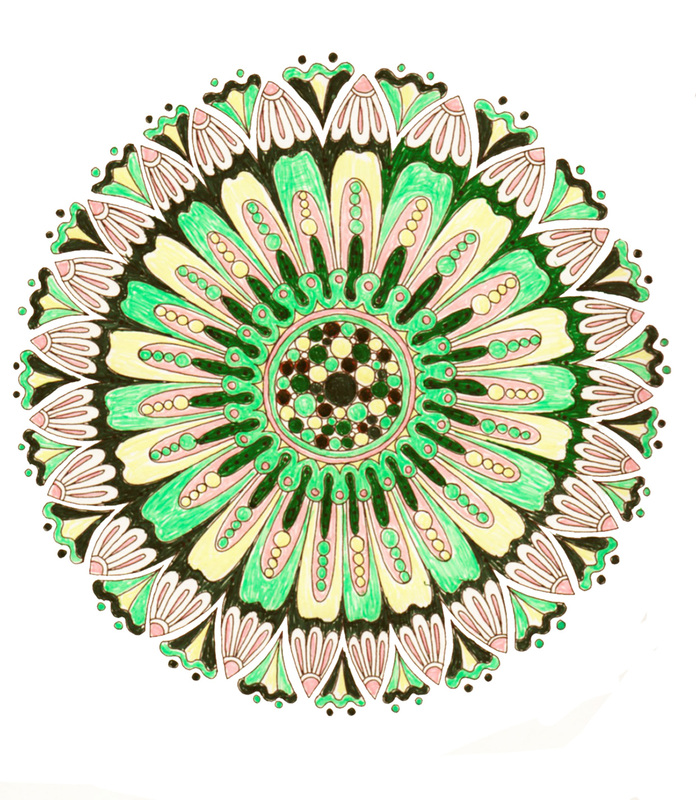 I even managed to avoid working on my blog by coloring another mandalas after I got home, which seems like an improvement to the first one. I don’t think coloring books, even ones devoted to mandalas, will take the place of my Muse headband, but I did find focusing on precise details quite relaxing, and addictive. 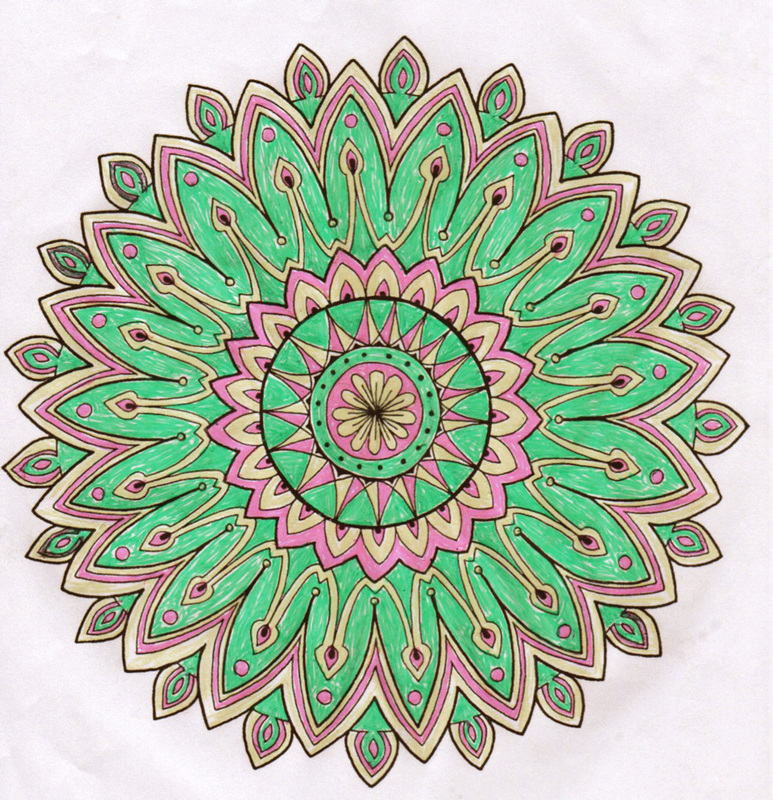 Perhaps coloring others’ mandalas over time will inspire me to create my own.